Northland Visions, started as Northland Native American Products, and has grown from a home-based, mail-order gift packaging business into a gallery and retail space where one can find treasures of the land, original items made by Native peoples from the Woodland and Plains tribes of the upper Midwest in what is now Minnesota, the Dakotas, Wisconsin, Canada and other northern states stretching from Montana to the east coast. 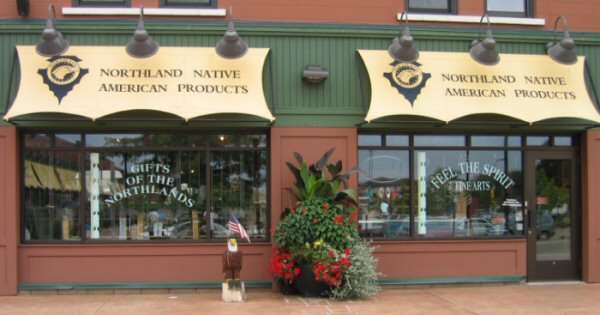 Northland started in 1995, and originally dealt entirely in gift products, making use of traditional north woods gifts. Hand crafted birch bark baskets and canoes filled with rare gourmet foods from the Ojibwe people and the Minnesota northland centering around natural hand harvested Wild Rice of Minnesota. These products are still available, and they come with the stories of their origins. For example, our wild rice is hand harvested from natural rice beds in the traditional way on our Minnesota reservations’ lakes and rivers. The Ojibwe people pole their canoes through the rice and use wooden batons to knock it into the canoes. Then the rice is hand parched using wood, not gas, to preserve the aroma and the natural brown-green color. Here at Northland Visions we sell packets of our wild rice, along with syrup and jellies made from the wild berries of the land. Among the many mouth watering types, we offer chokecherry, hawthorn, highbush cranberry, rose hip, black currant, and wild plum, flavors that one certainly cannot find at many grocery stores in town. The gallery is truly an oasis, a sensual experience given over to celebration. One walks in to the quiet strummings of music, the gentle scents of sage, cedar, or sweet grass, and a warm greeting from the owners and the staff. Then, one can wander and drink in the beauty of art, scent, and words. There are dream catchers, soy candles, and books. There are sculptures of elders, horses, eagles, and the White Buffalo. There are dance sticks, drums of all sizes, and blankets of many colors. And there are prints and paintings whose names offer only a hint of their visual poetry. “Lakota Twilight,” “The Matriarchy,” “Feeding the spirit,” “beyond Time,” and “Circle of Life” are only a few of the many paintings that have adorned the walls of our gallery. The art of Northland Visions is unique and diverse, some of it traditional, some of it quite modern. The art tells stories. And one can learn about the background of the artists as we share the how and the why of the person behind the art in order to honor them. We have seen how good people feel when they come into this space. We believe they feel the emotions of the art itself. Everything in here has been created to be shared. Come share the experience with us, here at Northland Visions, and feel the spirit.